On September 20, 2017, Hurricane Maria devastated the island of Puerto Rico. Over 200,000 Puerto Ricans have been forced to flee the island in search of a roof over their heads, a job, an open school. In the aftermath of the hurricane, over 3,000 people died, hundreds of thousands of people lived without electricity or portable water for months, and close to 60,000 homes were still roofless eight months later. But the story of Puerto Rico after Hurricane Maria is not just a story of devastation. It is also a story of resilience, dignity and collective power. In the face of a negligent and inept response by the federal government, people turned to each other for support. Across the island people organized, forming volunteer brigades to clean up roads, rebuild homes, install solar panels, assemble massive soup kitchens to make sure everyone could eat, and more. Out of a an unprecedented crisis, people built power and and began to craft a new vision for a just recovery. This crisis was not simply the result of an unprecedented natural disaster. Rather, Hurricane Maria lifted the veil on the impact of colonialism, a predatory economy, austerity, structural racism, and climate change. In Puerto Rico, an otherwise natural disaster, amped up on climate-change steroids, slammed into a place that has been systematically stripped of foundational rights and the basic elements of a just economy. Even before Hurricane Maria hit the island, Puerto Rico and its people were suffering the ravages of a Wall-Street induced debt crisis that left 46% of Puerto Ricans living in poverty, combined with, devastating unemployment and a crippled public infrastructure. In response to the debt crisis, the federal government imposed a fiscal control board that further removed democratic rights from the Puerto Rican people, and instituted a regime of austerity that forced the closing of hundreds of public schools, cuts to public pensions, and raised taxes on working class Puerto Ricans. In the months and years after natural disasters like Maria, the most vulnerable communities, usually poor communities of color, are largely left out of rebuilding initiatives. Too often, the destruction is used by developers and corporations as an opportunity to turn a profit, privatize public services, and displace communities. The same can be said for what is currently happening in Puerto Rico. In the face of this crisis, no comprehensive aid package has been provided from the federal government. Instead, to solve this crisis, the federal government is pushing for the privatization of electricity, the privatization of schools, higher tuition at public universities, higher taxes, spending cuts for the social safety net, and broken union contracts. With this context, the CPD Network took action to support initiatives led by Puerto Rican people leading frontline efforts to address immediate relief needs and to organize for an equitable Puerto Rico over the long term. Before Hurricane Maria made landfall, CPD mobilized to launch the Maria Fund. The Maria Fund, which is governed by a board of Puerto Ricans from the island and the diaspora, is dedicated to supporting long-term organizing to build an equitable Puerto Rico. Today, the Maria Fund has provided grants to 33 local community groups and organizations that are working on the frontlines to build organizing capacity and address critical needs in Puerto Rico’s hardest-hit communities. The community organizing work of Maria Fund recipients aims to transform the root causes of the crisis, building a new sustainable Puerto Rico. Stateside, CPD is supporting Puerto Rican people displaced by Hurricane Maria and long-term Puerto Rican communities to build organizing capacity and power in coalition with Puerto Rican organizations, leaders, and advocates from across the country working together to demand a Just Recovery for the island, as well as dignity and opportunity for Puerto Rican communities in cities across the US. 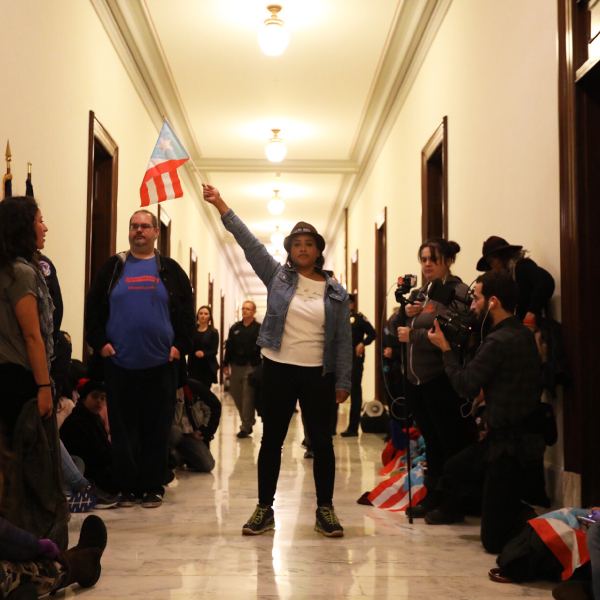 Since the hurricane, CPD affiliates Organize Florida, CASA Pennsylvania, New York Communities for Change, and Make the Road in Connecticut, New Jersey, New York, Pennsylvania, and Nevada have engaged thousands of newly arrived Puerto Ricans connecting them with services, nurturing their leadership, and supporting them in efforts to win local and federal policies that allow people the freedom to stay in their new home, or return to the island. During this time, the CPD Network has mobilized thousands of people, organizing actions to lift up the demands in Washington, DC, and local city halls and state capitols across the US. Today, our efforts and organizing are building power in key states where the voices of Puerto Ricans can shift the political future of the United States and, in doing so, build the political conditions that make it possible for Puerto Rico to have a Just Recovery and self-determination. As we mark the one year anniversary of Hurricane Maria on September 20, 2018, together with our partners and allies, we are hosting 80 vigils in 20 states to remember the nearly 3,000 people whose lives were lost as a result of the storm. These actions mark an important moment of resistance and remembrance, and a recognition of the resilience and dignity of the Puerto Rican people. The CPD Network is committed to supporting the vision and leadership of Puerto Rican people in the aftermath of Hurricane Maria and beyond.